Virginia creeper ‘Engelmannii' (Parthenocissus quinquefolia 'Engelmannii'): growing, planting, caring. A cultivar with bright red leaves in Autumn. More elegant than its parent species, with brighter colors too. 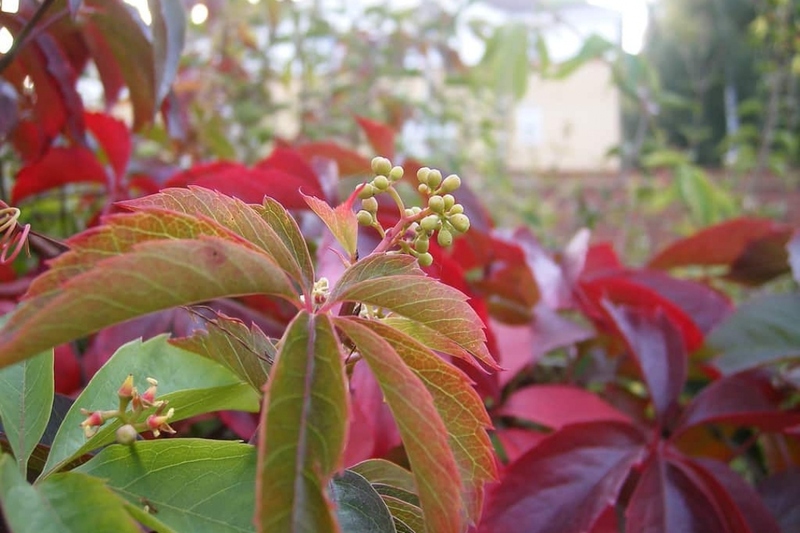 The variety 'Engelmanii' is a climber with leaves composed of 5 fine leaflets, which turns scarlet in autumn. Plant preferably in the fall, in fertile, drained soil, in the sun or partial shade. Dig a hole twice as large as the volume of the clod, arrange the clod at the right height to keep the root collar visible, and replace the earth around it. Place a stake to drive the plant to its final trellize. Form a hollow in the earth around the plant, and empty at least two watering cans in it. Mulch after planting, and renew each year in November, with leaves or crushed wood. Water once a week for the first month - and keep an eye on your plant for the whole first year. The potting soil of potted plants should never be totally dry. Collect the seedlings that have settled in the spring and place them in a bucket filled with sand, soil and potting soil.